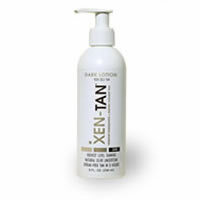 Self Tanning Xen Tan Lotion. Xen Tan Lotion is a dark suntan lotion with a natural instant colour guide for an even, strealkess application and seemless result every time. Xen-Tan Lotion has a pleasant fresh cherry-almond fragrance, which sets Xen-Tan apart from the characteristic chemical smell of other products. The rich coconut and walnut oils of the dark lotion results in luxurious feel and a beautiful, streak-less tan that lasts twice as long. Each bottle of Xen-Tan, gives an average of 5/6 full face and body tan and a tan that shall last for up to 7 days, whilst allowing you to decide how dark you want to be. Apply a thin coat you get a lighter tan. Apply one or two thicker applications you get a really dark olive tan.